I remember sitting in 'Fanny' Bowen's class at the tender age of 10, looking out over the road from the green hut, at the granite classroom on the eastern end of the old school. This was Jim Holt's classroom where the 'Top Class Boys' were taught. To us, reaching the age of eleven was a daunting prospect because we knew that if we didn't pass the 11 plus exam, we would all end up in Mr Holt's clutches. He was renowned for being a disciplinarian and presented an aura of authority. I always remember him as standing upright, shoulders back, chest out and always immaculately dressed. Even when we went to the sports field he would be there in a beautifully pressed suit, refereeing the football or umpiring the cricket. At the time we thought Miss Bowen was strict, but Jim Holt we knew to be in a different league. We eagerly awaited the results of the 11 plus exam. Glen Tilsley = 'pass' - Roy Duncan = 'pass' - John Holt (Jim's son) = 'pass' - Glynne Lucas = 'pass'. I jumped for joy, now I would be going to Truro with my mates. Alas, a few days later my heart sank when my parents were informed that due to there being a limited number of bed spaces at Truro school, only 8 of the 10 who passed would be going away. I'll never forget waiting outside Mr Browse's office waiting to go in for my interview to see if I would be one of the lucky 8. Well, everyone knows the rest...Billy Lethbridge and myself failed the interview and had to stay behind. I said cheerio to my friends as they went to the quay to get aboard Scillonian ll for the start of their epic adventure, then bowed my head and thought of what was in store on a more personal level. Reggie Thomas, Ian Jones, Brian Molyneux, Billy and myself entered his classroom in a line. I looked around at the cynical grins on the other pupil's faces as we like lambs were led to the slaughter. There were 5 empty desks on the front row, we each stepped behind one of them. I looked at mine and couldn't help notice the deep gouges forming the initials of those who had survived before me and had moved to a row further back. I pondered over what had been used to create those gouges. 'Mr Holt' laid down the law and told us what he expected from us. Believe me when I say that he had my undivided attention. Over the next few weeks we settled in and it soon became apparent that due to the fear of punishment at the hand of 'Jim the Almighty' himself, we were actually concentrating on the lessons and actually learning something. I realised that so long as I tried, I was helped. If I didn't try, I was given the infamous 'eye'. If anyone still failed to try after getting the 'eye', they got thumped and deservedly so. The rules of logic soon taught us it was much easier to 'tow the line'. The 'Top Class' consisted of 4 'forms'. These were, the lowest of the low 7b, then 7a, 8b and the oldest boys 8a who only had a year left at school. The numbers making up the 'forms' depended on the number failing the 11 plus, so sometimes a 'form' would consist of 5 or 6 boys and in some cases it would be 8 or 9. When I first moved into Jim's class, there were nearly 40 boys under his control. Those numbers diminished over the 4 years I was with him, even so when I left school at Christmas 1962, there were still over 25 boys in his class. He taught us everything, Geography, History, Maths, English, Geometry, Trigonometry, Algebra & Science. He taught us Soccer, Cricket and countless other games. My all-time favourite was 'dodge ball'. He was fluent in the German language and taught German out of hours to anyone who wished to learn it. He would also stay after school to go through anything that was causing concern to any of us before an exam. Yes, I saw him smack boys around the back of the head for not paying attention or messing around, Yes, I've seen him throw a wooden blackboard eraser at someone on the other side of the room, Yes, I saw him knock 3 boys from the central aisle into their seats, which in one case was a distance of about 12 feet and in another instance I saw the aftermath of a 'caning' which he had personally administered. I never, during the 4 years that I was in his class, saw him hit, smack or punish in any way, someone who did not deserve it. I found him to be a fantastic teacher in every aspect. He not only taught every subject, he taught boys from the age of 11, through puberty until they left school as young adults at the age of 15 yrs. Those are in my opinion, the most influential years of anyone's life. He taught us self respect and to treat others as we would prefer to be treated. I think probably the greatest accolade I can pay the man is to say that apart from teaching us in the daytime, he was also our scoutmaster. Out of 40 boys in his class, only a handful were not in the scouts. If any one of us had thought of him in any lesser way, we would not have been willing to spend any more time with him than absolutely necessary. He taught us field craft, tracking, basic navigation and map reading, He showed us tips on how to 'see' in the dark and he brought out the competitiveness in each of us that would see us through in later years during times of adversity. I have often looked back and thanked my lucky stars for failing that interview which denied me entry into Truro school, because if I had passed it instead, I would have never met Jim Holt. If he had not been a man of outstanding attributes, we would not have paid for him and his wife Hilda to come back to the Islands to attend a reunion on his behalf some 25 years after he left the Islands, ( one ex-pupil travelling from the U.S.A. to attend) most of us wouldn't be in the jobs we are in or the places we live and I certainly wouldn't be writing this epitaph to him. 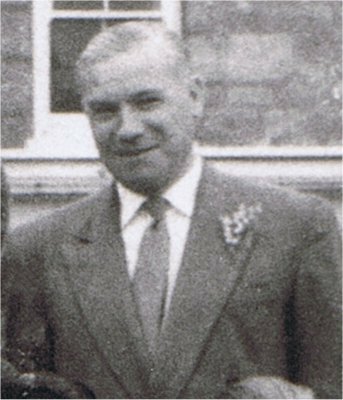 Jim was born on Feb. 9th 1917 and was laid to rest on Monday 15th May 2006 aged 89yrs. My sincere condolences to Hilda, his wife for 60 years. God bless Jim Holt and may he rest in peace.